For the first time in six years, Canada lost its spot as the No. 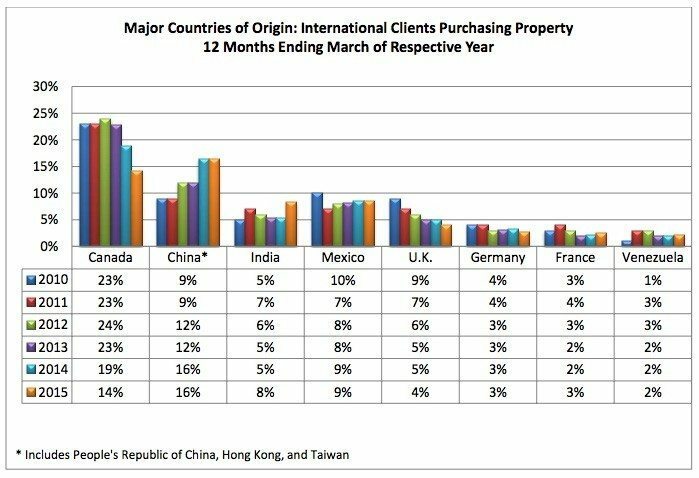 1 foreign investor in U.S. single-family homes — China now tops the list. 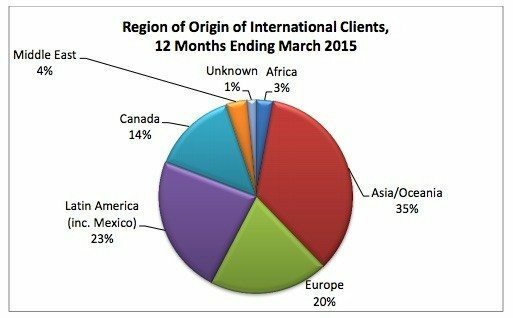 Canadian buyers acquired $11.2 billion of residential real estate spanning April 2014 to March 2015, according to a National Association of Realtors report that eyed international homebuying. The $11.2 billion committed represents a $2.6 billion decrease in volume when compared to the previous 12-month period — where Canadian investors contributed $13.8 billion. The recent total also represents the lowest 12-month investment period for Canadians since 2008, when $8.9 billion was committed. Roughly 41 percent of purchases made were in Florida, with 16 percent in Arizona. The primary reason for these markets’ attractiveness: warm climates. Of all the purchases, 47 percent are intended to be vacation homes, with a majority of them in suburban or resort locations. On average, Canadian buyers purchased a property valued at $380,300, with roughly 73 percent of those buyers acquiring via all cash. According to the report, when the Canadian dollar was stronger in 2011-2012, more Canadians purchased homes with all cash. Today’s costly currency exchange rate has made some buyers reconsider mortgage financing and approach the U.S. homebuying process differently. Despite a weakening Canadian dollar, the report states that U.S. single-family remains an attractive investment for Canadians because of its relatively low cost when compared to markets like Toronto – where the average cost of a detached home exceeds $1 million. Some larger Canadian investment firms are focusing on multifamily acquisitions and development rather than single-family. Active buyers of U.S multifamily include The Sheiner Group and PURE Multi-Family REIT. Similar to single-family investors, Canadian groups that target rentals prefer Florida. AIMCO and Equity Residential, both REITs, recently sold properties in Orlando to Canadian-based firms. At least three Canadian firms will provide equity for second-half project starts in the U.S. These groups include Ivanhoe Cambridge, Bentall Kennedy and the Canadian Pension Plan Investment Board. These equity partners will typically team with large national or regional developers or REITs.